Even if you don’t live in Spain, you probably have heard by now of the “Spanish revolution” that started taking place in the Plaza del Sol of Madrid and which after a few days extended to many other cities of Spain. It’s a peaceful protest, iniciatively kicked off by twitter messages of young people who are fed up with the current shortages decided by the Spanish government and of course, by the alarmlingly high rate of unemployment in Spain. What could be a more peaceful way to say “Give us REAL DEMOCRACY!” than just camping together with tents on local squares where they get the biggest attention? As we have local elections today on Sunday, these demonstrations actually are illegal, due to the period of reflection. Many people who didn’t take part actively in the protest before, showed their sympathy and solidarity by joing during the last days and bringing along some self cooked food or water bottles. 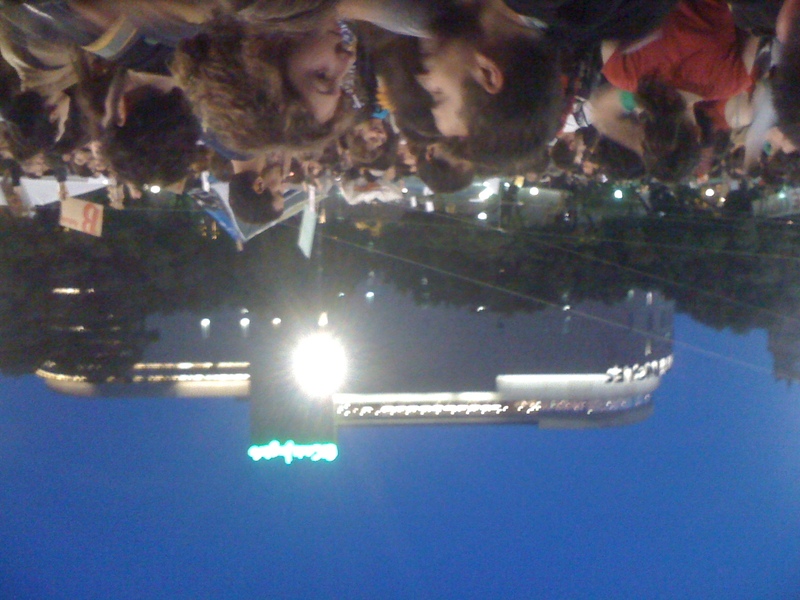 A great part of the people who showed up yesterday at the Plaza del Sol in Madrid or here, at the Plaza Catalunya in Barcelona were afraid the peaceful camp sit-in might be cancelled by the police during the day. But fortunately, that didn’t happen. Ok, what’s that got to do with me personally? 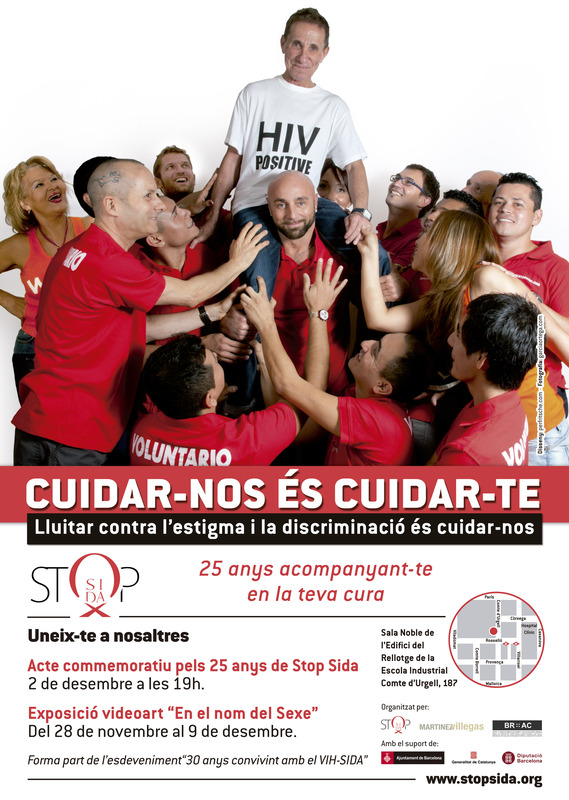 Well, I’ve been living and working in Barcelona for more than 13 years now and was always so lucky to be with work. But still I think it’s important to give at least a little gesture to show solidarity to the millions of unemployed people in Spain because it could affect anyone of us tomorrow. Team Vitamina D: Anne Laure, me, Filipe and Ana (taking the shaky pic). Hence the funky "apple mobile"! 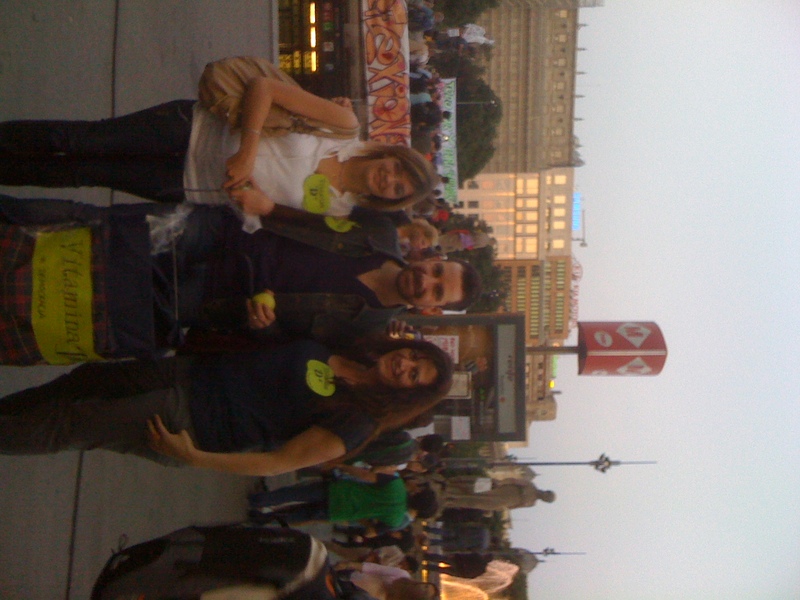 So together with some friends we filled a shopping cart with apples and took them to Plaza Catalunya. Why apples? Well yes, first I thought, water bottles were the most useful idea but none of us owns a car (What for in a big city like BCN?) and how much could we carry through the crowds? So the idea of apples came up – they are cheap (in bags of 6 or 8 pieces), they’re a healthy refreshment and they’re sustainable since there’s hardly no garbage left. 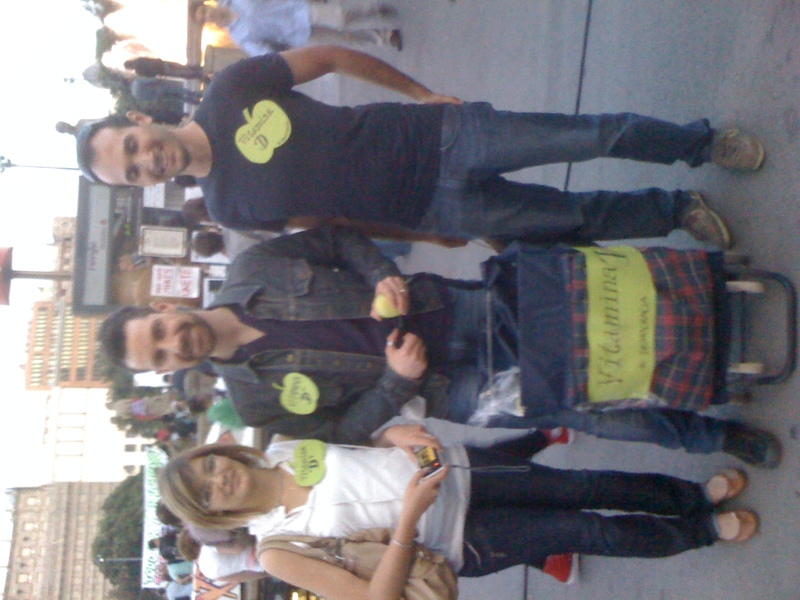 So we cut us quickly some apple-shaped badges with the slogan “Vitamina D* *Democracia (Vitamin D* *Democracy) and then we hit the crowds at the Plaza. We weren’t the first who supported the people with food and drinks but still the reactions were very warm and grateful. The demonstrations still continue today. It’s local election day. Let’s hope everybody votes wisely. 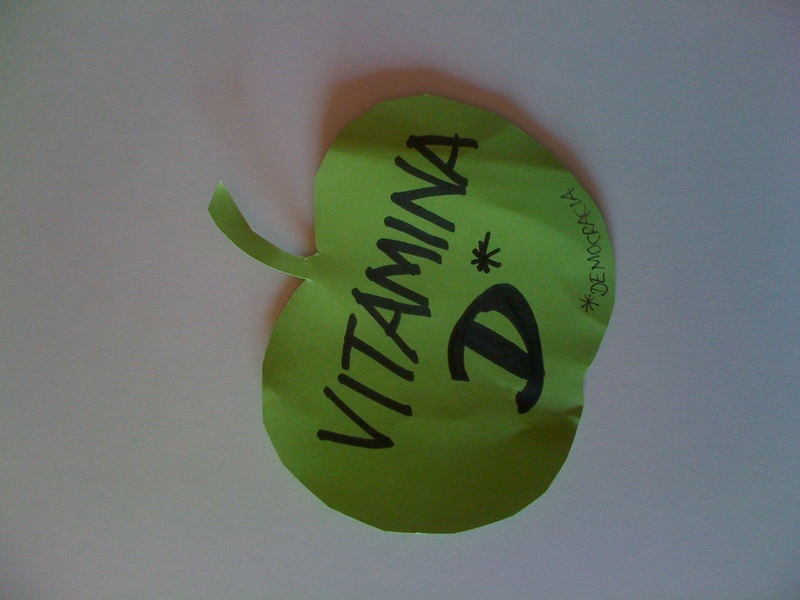 Nice Sunday everyone and remember: An apple a day keeps the doctor away!